The tourist attraction has been in the city since 1995. EDMONTON — For sale — one boat, seats 399. 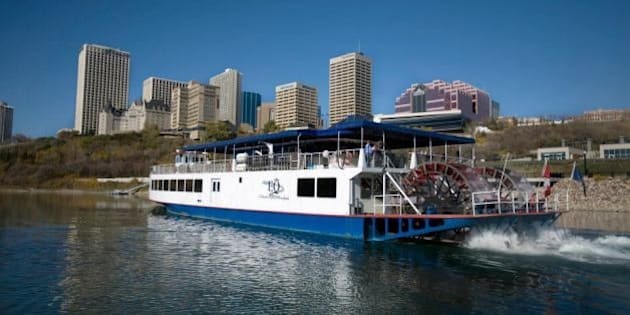 Edmonton's river boat has been put on the auction block by its owners, a numbered company representing interests from five First Nations in the Lesser Slave Lake area of northern Alberta. Mickey Spencer of the Sawridge Group, which is handling the sale, says the sellers are looking for someone who will keep the Edmonton Queen in the city. He says after all the trouble it took to get the boat to the North Saskatchewan River, the thinking is the boat is going to stay. He says it's too wide a boat to be put on a highway and hauled anywhere. But he thinks if it were put on pilings or some kind of permanent structure, it would make a beautiful waterfront restaurant. The boat has been a tourist attraction in the city since 1995 . There's a viewing planned for April 23 and the sale is to wrap up May 2. "If it does not sell for which ever reason, they plan on opening it up again this spring, summer, fall and running it as per usual,'' Spencer said.